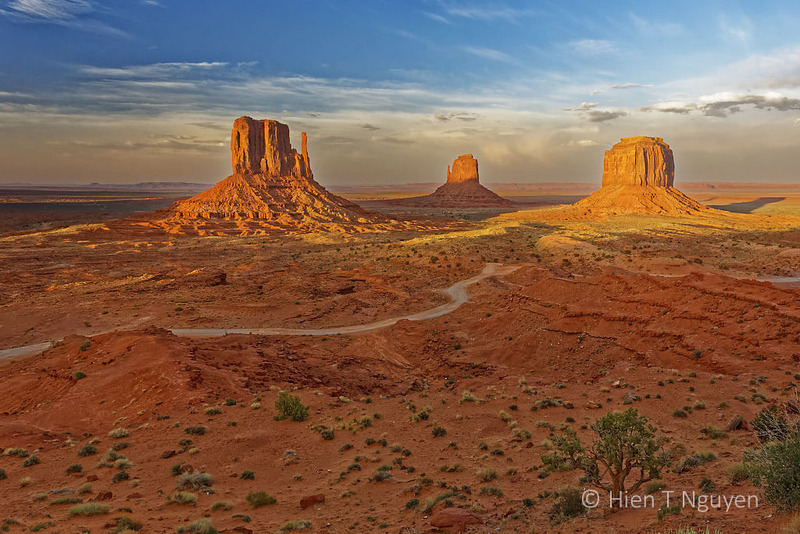 This is one of the most spectacular Monument Valley photographs I’ve ever seen! My biggest mistake on our western road trip planning last year was not to reserve enough time for touring Monument Valley. My husband voted for Chaco Canyon instead, and since I had planned most of the route, I wasn’t about to take that (also incredible) experience away from him. Hopefully I’ll make it to Monument Valley in 2019 or 2020! You certainly were there at just the right time to catch this wonderful light. Well done. It looks like you were there at the perfect time, though I bet it was hot. That is one beautiful photo, Hien! Perfect! Magnificent. This is definitely somewhere I want to visit. You will definitely like the landscape of that region! Thanks Julie! It was my second time there, and the late afternoon sun obliged. Waiting for the right light was worth it! I used to live there so did a lot of exploring. I always wish I had more time there. What an exquisite photo. Beautiful capture! A beautiful capture of an amazing place! Such perfect timing to catch that incredible sunlight. Thank you! It was worth waiting for the sunset at that place. Hien this is a beauty to hang on the wall, absolutely beautiful! Thank you John! I will try to print it out. Lucky timing and great preparation. You were standing next to the Navajo Reception center. Congrats. Thank you! I waited at the visitor center for about an hour for the sun to set, and began taking photos when many others had stopped and gone back in. smart!! Most people just don’t think that way. We did the backcountry tour. There are some postings about it on my blog. We went there many, many years ago. It is a stunning location as your photo beautifully capture. It is more commercialized now, but that is something unavoidable. It’s a beautiful region! Thank you Dries! Such beautiful light. You certainly picked the perfect time to capture it. What a stunningly shot of the valley! It was worth waiting for that sunset. Thanks Amy! Wonderful photo! That entire area is so beautiful…..the Navajo and Hopi rez, Mexican Hat and its mountain, Valley of the Gods, Grand Gulch. You are right. There are so many places to visit in that area. That’s why it has been used in so many Western movies. I can see that! Wow! Such desolation. It must have been an awesome visit though. It’s a beautiful place to visit any time of the year! It is a beautiful, yet eerie place. The light here makes it quite dramatic! I wonder if they have paved the road through there. I checked on the Monument Valley site and that dirt road has not been paved yet.